I normally try to make something special for weekend breakfasts. It’s fig season, so I had a bunch of figs in the fridge to use up. 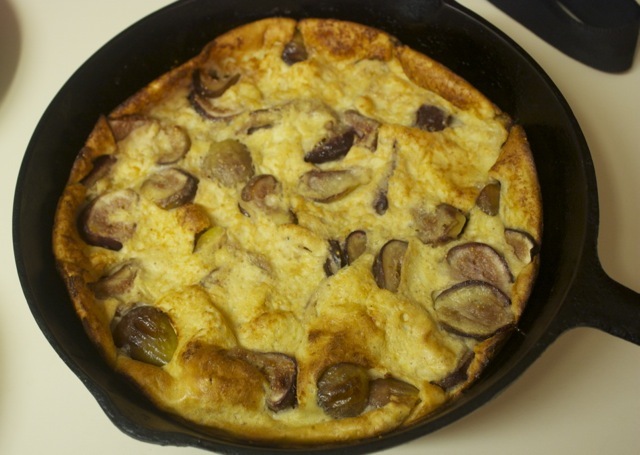 I’ve made a pear bismarck before, and that went over well, so I figured that could be reconfigured to use figs. Turned out quite well. I did cook the figs for a bit to cook off the water and start browning them. Meanwhile mix the eggs, flour and milk. Put the pan in the oven and bake 25-30 minutes until golden brown. 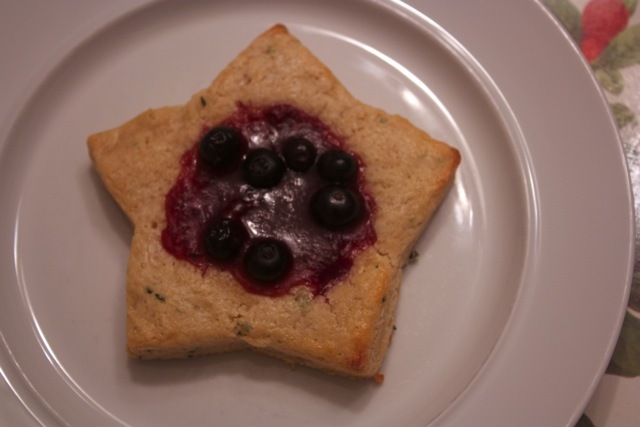 We made these star-shaped scores with raspberry jam and blueberries for breakfast on the 4th of July. The recipe is one we use a lot, found here. 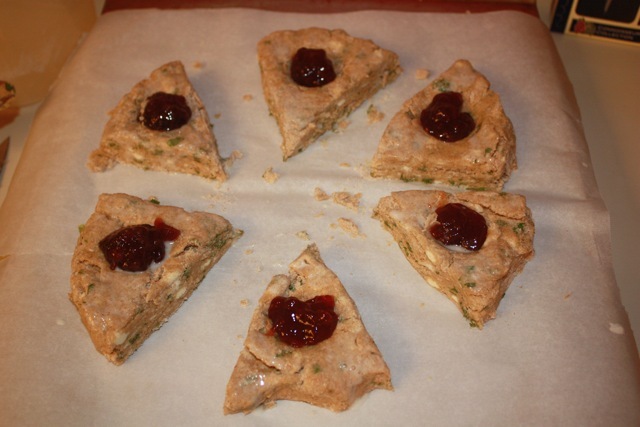 Author mattPosted on July 8, 2012 Categories Breakfast, RecipesLeave a comment on Scones for the 4th! 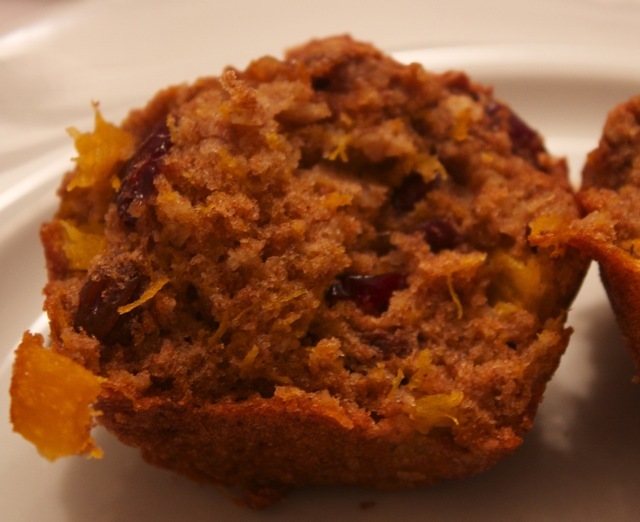 We had some diced butternut squash left over from the yummy butternut squash, sage and Parmesan pasties, so I found a recipe for muffins–make the kids eat the veggies for breakfast! While assembling the other ingredients cook the squash in a frying pan over medium heat. Stir it from time to time, but no need to pay much attention to it. It takes 15-20 min to cook, probably about as long as it takes to get the rest of the stuff below assembled. Preheat the oven to 350, grease muffin tins. Place the cranberries and raisins in a microwave safe bowl and cover with warm water. Microwave on HIGH for 1 minute. This is a speedy way to rehydrate the dried fruit. Drain off the water from the dried fruit. 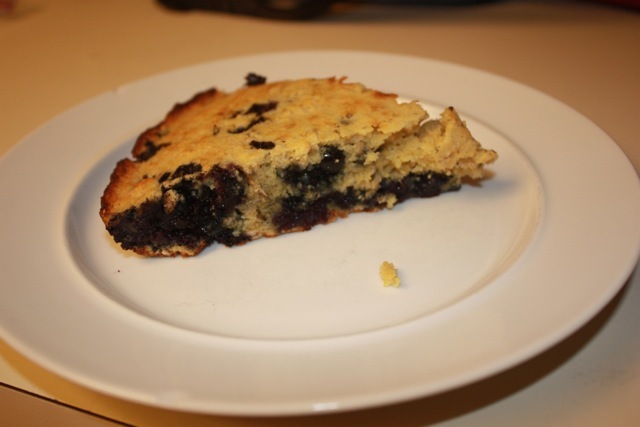 The rehydrated fruit won’t burn when it’s exposed at the top of the baked item. Combine the dry ingredients and the rehydrated fruit in a large bowl, mix well. Add the wet ingredients, adding the squash last, once it’s nice and soft. Stir everything together and spoon into the greased muffin tins. 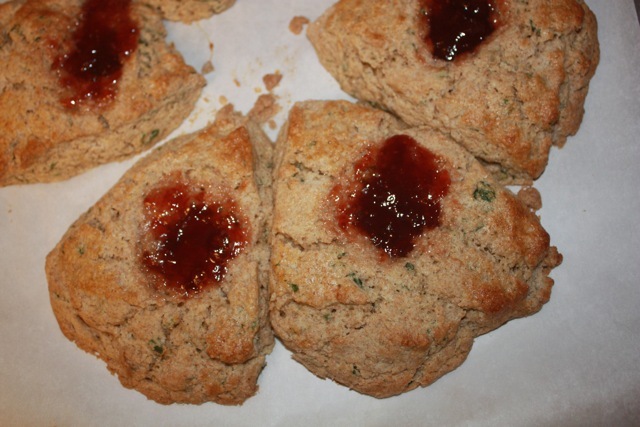 Last February, we found a recipe for Mint scones, and have made them a few times. 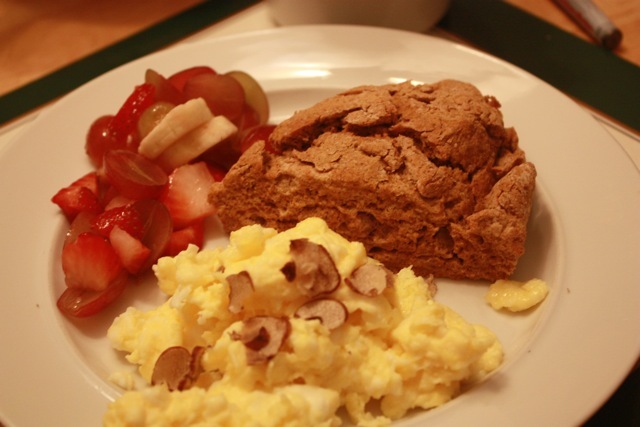 They are quite good, though I have always liked this scone recipe from Fine Cooking. So when it came to making Christmas breakfast I combined the two and made some delicious mint scones. Turned out we only had 1 cup of white flour, so I used some whole wheat too…still tasted yummy, and maybe a bit healthier! Preheat the oven to 400˚ and line a baking sheet with parchment paper. In a large bowl, combine the flours, sugar, baking powder and salt and mix with pastry blender. Use the pastry blender to cut the butter into the flour until the largest pieces are about the size of peas. Separate the egg, saving the whites. Add the egg yolks, mint and cream to the flour. Stir to combine and gently gather the dough into a ball. Place the dough in the center of the prepared baking sheet and pat it out into a disc about 1 inch thick. Slice into six wedges and spread the wedges out. Using a spoon make an indentation in the wide part of each wedge. Add about 1 tsp jam into each indentation. Put the egg whites into the measuring cup that you used for the cream and mix it up a bit. (The original recipe called for using another egg and a Tbs of milk, but this seems to work fine and is a lot easier). Brush the tops of the scones with the egg white. Mix dry ingredients together. Put about 2 Tbs of butter in a cast iron skillet and put in the heated oven to get the pan nice and hot. 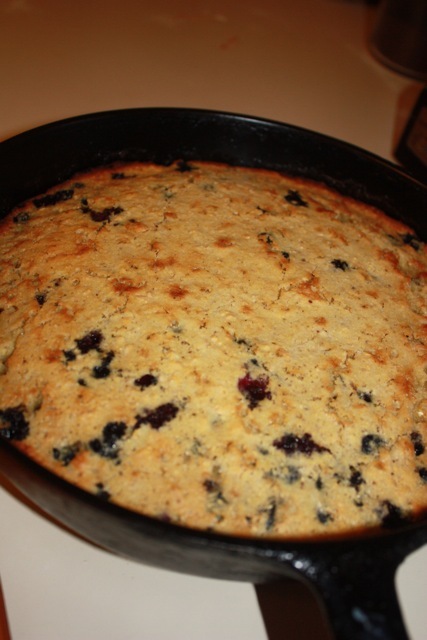 Add the melted butter, eggs, cream, 1/2 cup milk and blueberries to the dry ingredients and mix. The batter should be wet enough to pour, if it seems too dry, add some more milk. Take the pan out of the oven, tilt to spread the melter butter around, and pour in the batter. Cook 15-20 minutes until golden brown and cooked through. Slice and enjoy! 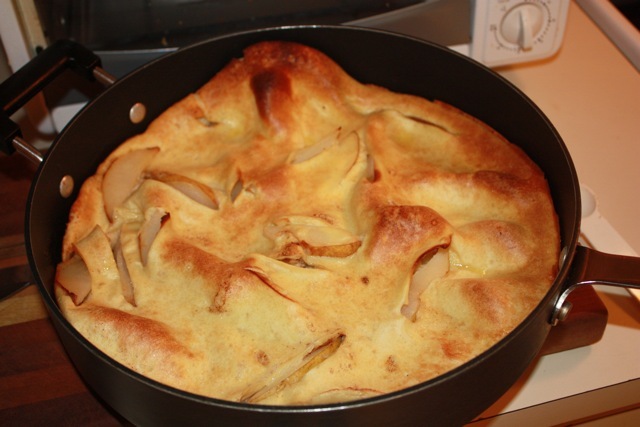 I’ve seen lots of names for these oven baked pancakes–bismarck, flapjack, popover…Some recipes cook the pancake and put the fruit on top after cooking (usually berries of various sorts), others put the fruit in the pan and cook with the batter (mostly apples). A neighbor has a pear tree that produced a super-sized crop this year and the kids picked a bunch of pears. I combined a few recipes to come up with this. I think most recipes are geared for a smaller (9in) pie pan sized dish, so this is doubled for a larger 12in pan. Preheat the oven to 450F. Slice the pear. Beat the eggs in a medium bowl, add milk and flour and mix. Heat an oven proof 12in pan on medium high heat and melt the butter. Sprinkle the brown sugar and cinnamon in the pan. 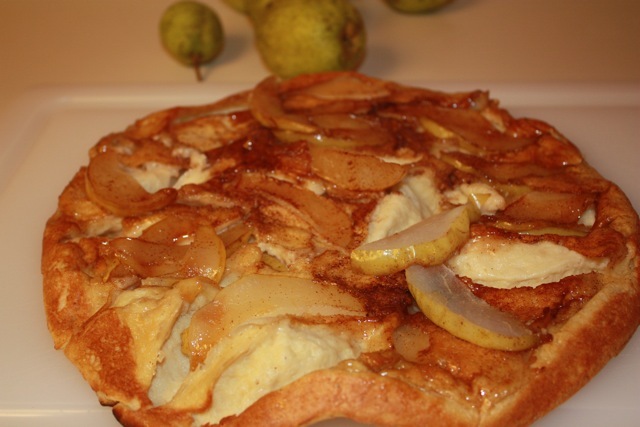 Spread the pear slices on the bottom of the pan. Top with the batter and bake for 25-30 minutes until golden brown. Loosen the edges and turn upside down onto a plate or cutting board. Slice and serve. Some recipes call for sprinkling with powdered sugar and/or adding maple syrup, but neither is needed really. It’s blueberry season here in north Florida and we picked 16 lbs of them yesterday! We also just got a donut pan to make baked donuts–unfortunately, we haven’t been able to purchase donuts that aren’t made on shared equipment, so our nut allergic son hasn’t had donuts in a few years since the last place changed their practices. I fond this excellent recipe at Eat Good 4 Life–so they’re even (comparatively) healthy! They were an excellent treat! Slightly modified from this excellent recipe. Preheat oven to 325°F. Spray donut pan with cooking oil. In a large bowl, whisk eggs, milk, sugar, vanilla, oil, nutmeg and cinnamon. Add flour, baking powder and baking soda. Whisk until combined. Carefully fold in blueberries. Fill each donut hole 2/3 full. Bake for 15-20 minutes. Cool for about 5 minutes and remove from pan to a wire rack. [Cool completely. ]–who can wait that long…they are yummy still warm, I just continued on. In a bowl combine sugar and cinnamon. In another bowl place melted butter. 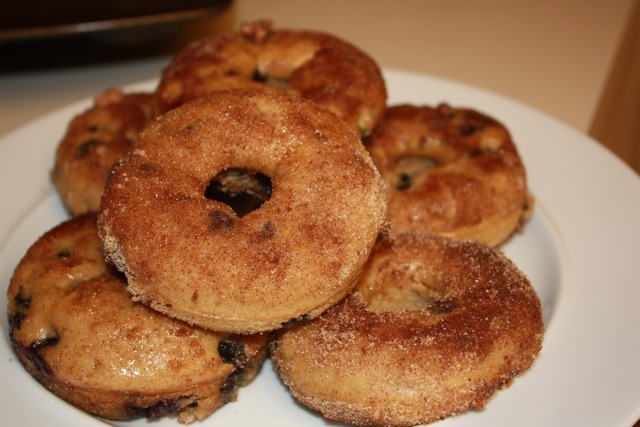 Dip each donut in the butter followed by the cinnamon sugar. I generally avoid coffee cakes since they take so long to cook. But this morning I woke up early enough that I decided to give one a try. We had some sour cream that needed using, and I found this recipe at Two Peas & Their Pod, where I’ve seen some other great recipes, so I decided to give it a try. We ate it up too fast to take a photo…it was really good (besides, Two Peas has great photos of this)! I added a little extra cinnamon and skipped the glaze, but other than that, followed the recipe. We made these Honey Yogurt Waffles this morning. I modified it a bit, doubling the dry ingredients and bumping up the wet, but not double…should have taken better notes…The outmeal adds a nice texture and they turned out really nice and brown and crispy–maybe the yogurt or honey?